Author Judy Von Bernewitz’s newly released “Without Love’s Beauty and Pleasures Life Does Not Exist” is an emotional story of children born into poverty and abuse. 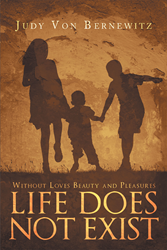 “Without Love’s Beauty and Pleasures Life Does Not Exist” from Christian Faith Publishing author Judy Von Bernewitz is an emotional page-turner, telling the story of three children born into a life of abuse, poverty and neglect. The story is told from the viewpoint of the oldest child, astonishing readers with the struggles faced by these young children. “Without Love’s Beauty and Pleasures Life Does Not Exist”: a heart-wrenching story of child abuse and neglect, and the struggles faced while hoping for a better life. “Without Love’s Beauty and Pleasures Life Does Not Exist” is the creation of published author, Judy Von Bernewitz, who spent 13 years working with deprived/neglected adolescents and almost 20 years working with adults released from psychiatric hospitals who were homeless. Published by Christian Faith Publishing, Judy Von Bernewitz’s new book is an emotional page-turner, telling the story of three children born into a life of extreme poverty, child abuse and neglect. The story is told from the viewpoint of the oldest child, the only girl. The abuse these children suffer is heart-wrenching. The youngest child dies a tragic wrongful death. The middle child suffers with what will later be known as early childhood mental illness. The oldest child struggles to get away and be free from this tragic and dysfunctional family, hoping to find a better life on the other side. View a synopsis of “Without Love’s Beauty and Pleasures Life Does Not Exist” on YouTube. Consumers can purchase“Without Love’s Beauty and Pleasures Life Does Not Exist” at traditional brick & mortar bookstores, or online at Amazon.com, Apple iTunes store, Kobo or Barnes and Noble. For additional information or inquiries about “Without Love’s Beauty and Pleasures Life Does Not Exist”, contact the Christian Faith Publishing media department at 866-554-0919.